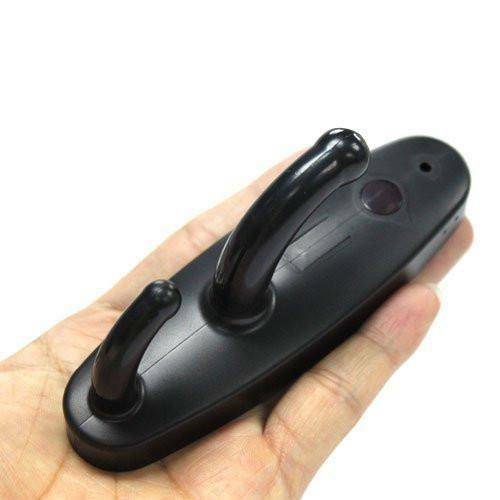 The Clothes Hook Spy Camera is a spy camera designed in the shape of a clothes hook. This can be used in a room or office environment to detect theft or any other suspicious incidents. 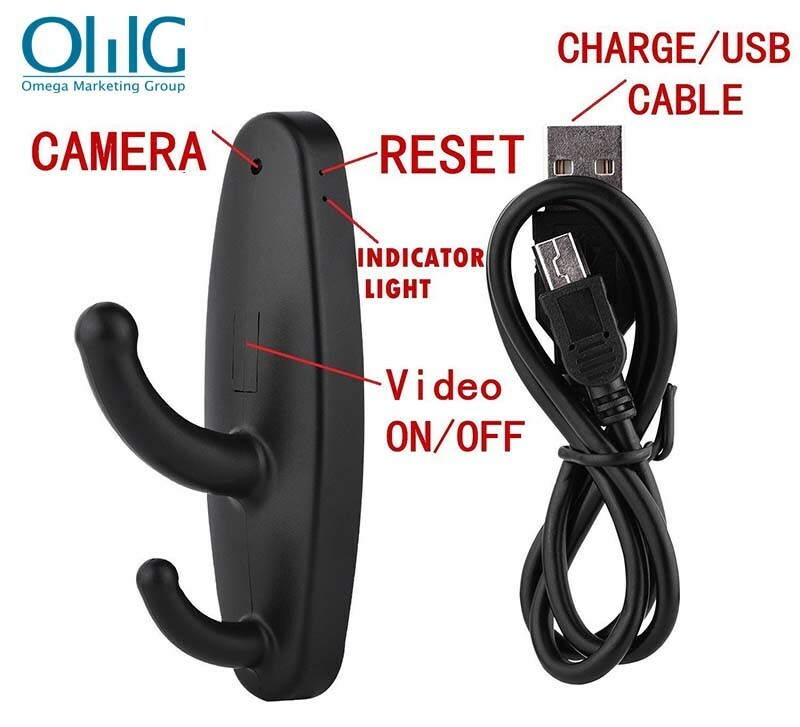 The Clothes Hook Spy Cam is small and simply designed, to ensure that it blends with the surroundings and does not look out of place in your home or office. 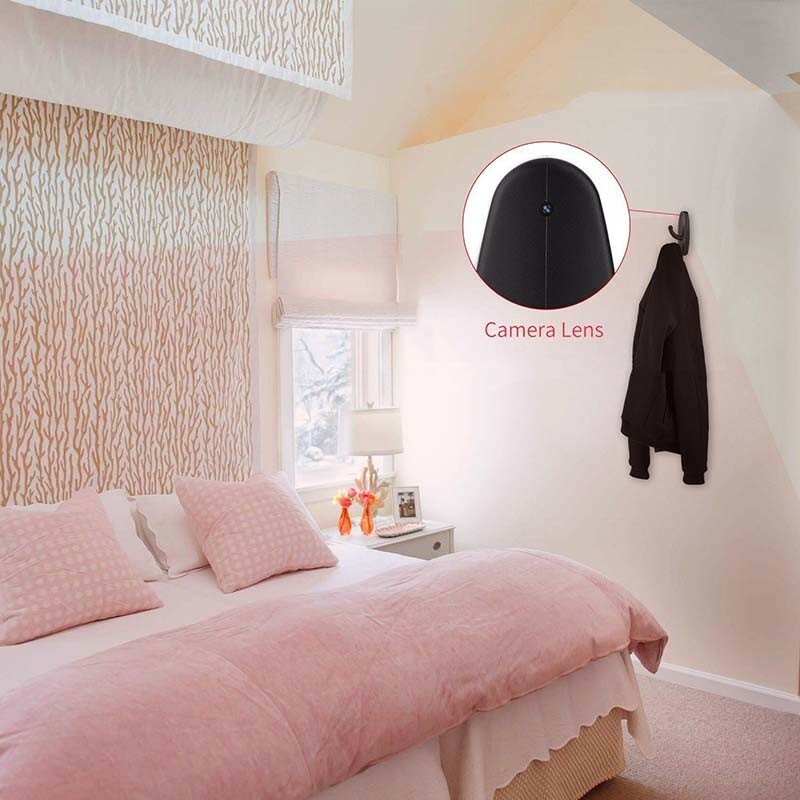 The Clothes Hook Spy Cam also has motion detection video recording, so you can set it to record only once it detects motion. 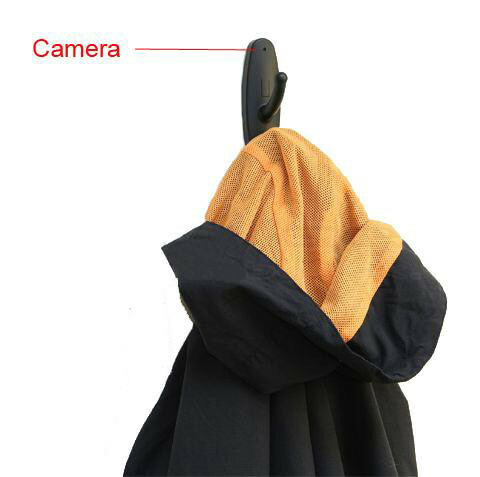 The Clothes Hook Spy Cam is easily detachable through its provided wall mount, and can be taken down easily for charging and data transfer. It has small coontour design which does UV spray finishing for the whole body. High definition image recording under low illumination. Support USB 2.0 and MAX 32G TF card. 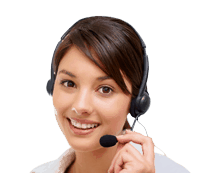 Support 30 fps for 720*480/1280*960. 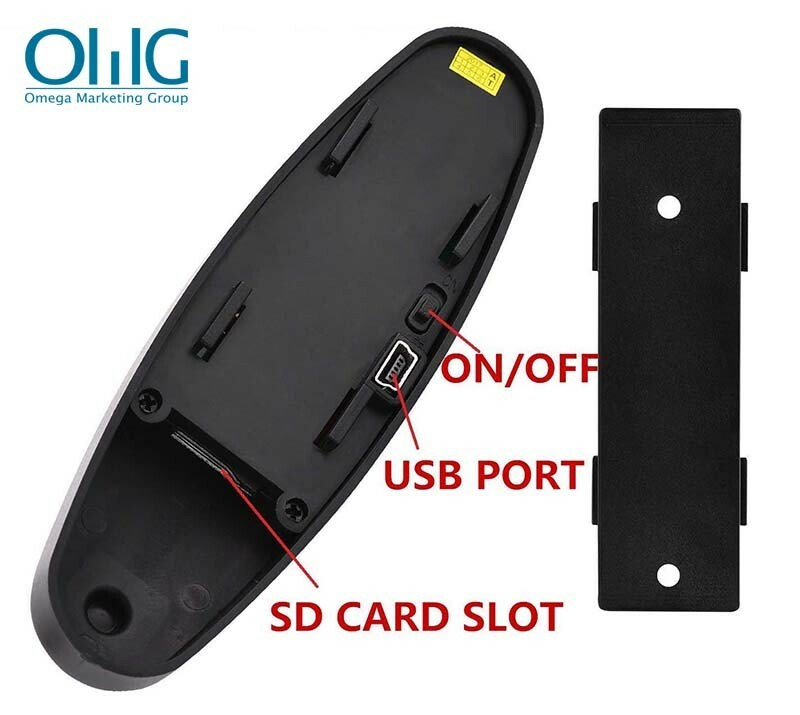 Built-in lithium rechargeable battery, PLEASE charge firstly before use. When charging, the green light will flash simultaneously; When fully charged, the green light will keep bright and Not flash. 1-2 hours charge will be enough and fully-charged. 2) Use adapter: Connect the charger plug with USB cable, then plug into electrical connector receptacle, it will be charged. NOTE: when the device is out of power or not enough power, it will enter into Protection mode and can’t be turned on. Therefore, make sure you have fully charged the device to make it working. Used imported HD lens to make sure the device carry out high definition and good quality images and videos; The miscrophone is also anti-interference, contains sound filter cotton and prevents SUB-sound damage to ensure crystal clear sound. PLEASE confirm that you have inserted TF card in the slot before recording. 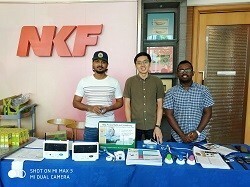 Notice: if you don’t insert TF card, the hook camera will auto turn off in 4 seconds; if you don’t insert card before you turn on the device, it will be easy to cause System Halted. 1) Power/Video: Push ON/OFF to ON and long press Video ON/OFF, the device will be in standby mode when the green light keep light and automatically record; press Video ON/OFF once again, the green light will turn off and you can manually take videos; then if you press Video ON/OFF button once, the green light will turn on and keep lighting, the device will be in standby again and automatically record and save files every 30 minutes. 2)Reset: When the device works abnormal because of wrong operation or other unknown reasons, you can reset the device by pushing ON/OFF to OFF, it will work again and re-plug your SD card before you turn on the device. 3)Read Files: Connect the device with the computer directly or use card reader. Once the computer detect the device, you can read, copy, cut, pause and delete files. You can also reset the time via creating txt. You can follow the manual to see details. You can use it as a normal clothes hook, but please remind that it can’t bear too much weight. You can install it in your bedroom, living room, kitchen, corridor, porch and anywhere of your house. It is a nice decoration with a spy camera which will provide you a Second Eye to catch your home circumstance.